Los Angeles, CA – While on tour with his American power trio – supergroup, The Winery Dogs, Mike Portnoy filmed an epic and personalized invite video to his first ever Progressive Nation at Sea Cruise. Taking you band by band and leading you through the musical adventure that attendees have to look forward to at this one of a kind, floating Progressive Rock festival taking place February 2014. 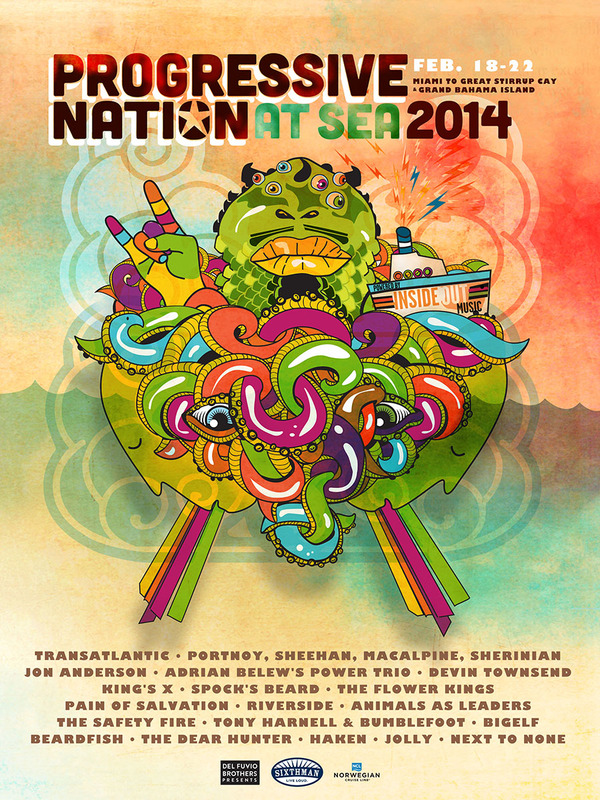 Mike Portnoy had this to say: “I could not be any prouder or any more excited than I am for Progressive Nation At Sea 2014. It is my ultimate dream lineup ranging from legends like Jon Anderson & Adrian Belew to Prog trailblazers like Spock’s Beard & the Flower Kings to today’s most extreme cutting edge artists like Devin Townsend and Periphery. Check out the FREE PN14 Sampler presented by InsideOut Music & Guitar Center: http://www.insideoutgcsampler.com and enter for your chance to win an all expense paid trip to PN14 and a signed guitar from all the artists! Los Angeles, CA – Progressive Nation is hitting the high seas in 2014! Join us in this inaugural sailing from February 18th – 22nd 2014 on the luxurious Norwegian Pearl heading from Miami to Great Stirrup Cay and Freeport, Bahamas. This music festival at sea gives you an experience that a land festival just can’t match. In addition to 4 days in the beautiful Caribbean and all the amenities of a cruise ship; you will enjoy music from morning ‘til night with over 40 shows on multiple stages, along with activities, Q&A’s, panels and workshops from your favorite artists. PROGRESSIVE NATION founder Mike Portnoy elaborates: “In 2008 & 2009, I created a touring package called ‘Progressive Nation’ and with Dream Theater headlining, we did three full tours (two in North America and one in Europe) that showcased a variety of bands that embraced the spirit and musicality of progressive music.